Hi , we are trying to send out a survey through Pardot via GetFeedback , we are using a dynamic tag for "crm_id" which is the contact ID to map back to Salesforce. For some reason the "crm_id" is is not passed on in the email . Any idea's ? Hi , we are trying to send out a survey through Pardot via GetFeedback , we are using a dynamic tag for "crm_id" which is the contact ID to map back to Salesforce. For some reason the "crm_id" is is not passed on in the email . This is the HTML link in Pardot : " https://www.getfeedback.com/r/bWwCGEZagf_q=4&amp;ContactId=%%crm_id%% "
Thanks for the extra information! I read your question too quickly! 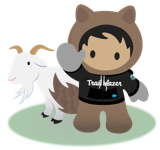 So you are using a custom object to collect the survey responses in Salesforce? This may be a silly question - How are you testing your email? Are you sending to an internal test list? You might know this already, but for variable tags to function properly you must send test emails to an internal test list. The internal test list will include you (as a prospect) and any others. Again, maybe you do this already. But I just wanted to check. If you send a test email using the "Send to Individual Emails" the variable tags won't work. The %%crm_id%% variable tag will reference either the CRM Contact ID field or the CRM Lead ID field on the prospect record. Because each prospect record will only ever have one or the other. So %%crm_id%% is the correct variable tag if you want to pull in either the contact or the lead Id from Salesforce. It links to both. Oh I had this same issue, and it took me a while to figure it out! So much testing! The trick is combining the Pardot variable tag with the Salesforce merge field into your GetFeedback URL. We have an automated email that is sent to new leads who fill out our online form. The process is as follows: Pardot immediately creates the person as a new prospect, then the Salesforce connector immediately creates them as a lead in Salesforce, then the Salesforce Lead ID is passed back into Pardot into a prospect field called "CRM ID." That last part is crucial, the CRM ID must be available in Pardot for the links to work properly. The %%crm_id%% is the ID that is passed from Salesforce to Pardot. If the CRM ID is available in Pardot, your Pardot email will automatically populate that variable tag. Thus, allowing your LeadID merge field tag to reference an actual Salesforce ID. Many thanks. Let me explain a bit more about how we've integrated GetFeedback. We've created a custom object for this which is linked via the " Contact_ID__c" We pass on this same contact ID, the actual Salesforce Record ID to GetFeedback to map the responses. The Salesforce Record ID of the contact is stored in Pardot under "CRM Contact ID". The field "crm_ID" doesn't exist on prospect level in Pardot though. Strangly enough the crm_id is available in the dropdown of variable tags. Many thanks, that worked. We created a new contact from scratch with personal email and the tag works. Great start of the weekend. Oh wonderful! I'm glad that worked out! Hope you have a good weekend too! I'm having this exact same problem. Did you solve this by referencing the Contact ID in the email, or did you do a mapping of the fields in Configure fields? I can't find this in field configuration, so I'm assuming it's an in email template reference, but want to make sure I understand. So glad someone figured this out, it's been plaguing me for months!